Made famous by winning the Big Tex Award at the Texas State Fair, the deep-fried Oreo is chocolate, melty treat you have to try at least once. This indulgent delight is surprisingly simple to make, and the only kitchen equipment you need is a deep fryer and a freezer. It may sound strange, but the first step in frying Oreos is to put them in the freezer. Freezing the Oreos will help them hold together in the fryer longer, as well as not break apart in the batter. You can freeze the Oreos for up to 24 hours to ensure they are cold enough for frying. Heat your fryer oil to 375 degrees Fahrenheit. If you don’t have a deep fryer, you can use pot on your stove. However, you’ll need a thermometer to ensure you don’t overheat the oil. Maintaining the appropriate oil temperature is critical to getting the perfect fried Oreo on your plate. Mix the pancake batter according to the instructions. Remove the Oreos from the freezer, and batter them one at a time by gently dipping the cookie into the batter until covered. It is best to fry each Oreo individually after battering them, as letting them sit covered in batter will make them soggy. Using a slotted spoon or a fryer basket, carefully lower the Oreo into the hot oil. Fry the Oreo until it reaches a golden brown on each side. You may need to turn the Oreo in the oil halfway through cooking. Remove the Oreo and let rest briefly on a paper towel before rolling it in the powdered sugar. This is the easy part. Enjoy your creation! Want to try something a little different? 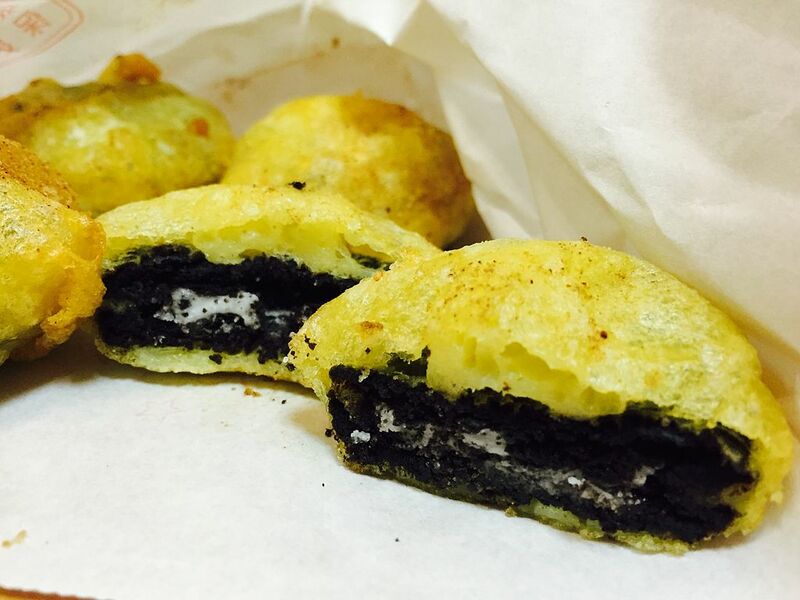 There are a number of variations you can try that will give your deep-fried Oreo a unique look! For example, you can replace the powdered sugar with a mixture of white sugar and cinnamon. You can also drizzle the Oreo with a chocolate sauce or with fruit syrup. Want some salt to go with that sugar? A variation that is popular in Korean markets involves wrapping the Oreo in bacon before frying. Looking for some more recipes? Check out the provider of the post, At Least We Fried for more deep-fried inspiration.